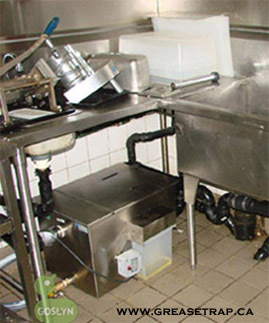 We will put Goslyn up against any grease trap or interceptor models on the market for ease of use, grease recovery, durability, and reliability. 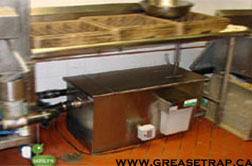 Goslyn Grease Recovery Devices excel with any sized 3-Compartment sink & automatic dishwasher simultaneously. Goslyn models perform under the toughest grease conditions. Stainless-Steel - Our systems are built to last. 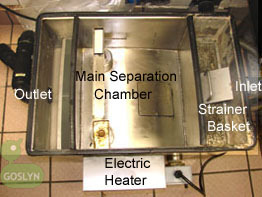 Goslyn also recovers grease from Range Hoods, Chicken Rotisserie and/or Combi-Oven suited for grocery stores (GOS-40). GOS 40 10US 16.0" 24.0" 16.0" 12.4" 10.5"
GOS 80 25US 20.5" 37.0" 24.0" 14.8" 12.4"
GOS 60LP 15US 14.0" 36.0" 16.0" 10.0" 6.7"
GOS 80LP 25US 14.0" 40.0" 24.0" 14.8" 10.0"
GOS 160 50US 21.0" 39.0" 24.0" 15.0" 13.0"
GOS 240 75US 27.0" 40.0" 24.0" 20.0" 16.0"
GOS 320 100US 31.0" 42.0" 24.0" 24.0" 21.0"
Goslyn Industrial Grease Recovery Systems are customized to the food manufacturing facility's needs. 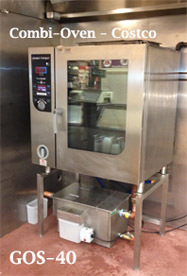 Food manufacturing facilities are unique in regards to processes, wastewater, and food contents. 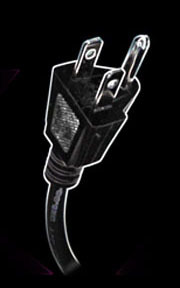 No two installations are exactly the same in food manufacturing. 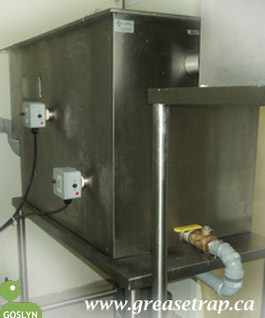 We provide a complete wastewater solution, not just the hardware.